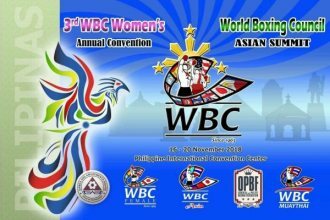 The World Boxing Council (WBC), whose president is Mexican Mauricio Sulaiman, confirmed that the WBC 3rd Women's Convention will held from November 16 to 19 in Manila, Philippines. Just weeks ago, the WBC successfully carried out its 56th Annual Convention in Kyiv, Ukraine, and without much delay, the boxing sanctioning body presses forward with the WBC Women's Annual Convention to be held together with summit meetings for the OPBF (Oriental and Pacific Boxing Federation), WBC Asia and WBC Muay Thai, all at the same time in the same beloved city of Manila, capital of the Philippines. The realization of these important boxing conventions in the Philippines is an idea and initiative of the Games and Amusement Board (GAB) Chairman Abraham "Baham" Mitra. The venue will be the historic Philippine International Convention Center (PICC) in Pasay City, Metro Manila. Inspired by all those wonderful fresh memories of many unforgettable moments at the WBC Convention in Kiev in our minds, we cannot wait to see you again. So we are happy to invite you to the WBC Women's Summit which will take place from November 16th to November 20th, 2018, in Manila, the beautiful capital of the Philippines. Women's boxing is growing very fast and gaining more and more recognition and public interest all over the world. Women's fights headline big events which are broadcasted live on TV in many different countries. We are proud to say that the WBC has been the front-runner of this development for many years. At this Summit we want to discuss the past, present and future of our beloved sport, address challenges, possibilities and also risks and, of course, celebrate and honor the many strong and powerful women who have made an impact inside and outside of the ring and continue doing so every single day. And this is only one part of what we are planning to do in Manila. Our good friend Abraham Mitra has developed the vision of a "4-in-1 Convention" with the OPBF, WBC Asia and WBC Muay Thai also holding summit meetings at the same time. There will be ring officials seminars, boxing clinics, medical meetings, a WBC Cares visit and many other activities including a gala award dinner and an exclusive boat trip. So, save the date. We hope to see many of you in the Philippines. The author Carlos Costa is a Panama-born veteran man of boxing living permanent in the Philippines. He will attend the WBC Female Convention in Manila. Carlos can be reached by email: Carlos512@hotmail.com and Whatsapp: +639184538152.